The second polar vortex of the month has arrived and with it comes snow overnight and crystal clear days which will leech all the warmth the city is able to trap during the day into the night air. We love comparing "how cold is it by you" and the weather people get their undies in one huge knot over "dangerous wind chills". The first vortex came with a dumping of snow. That was a bit tough to deal with. I cleared the deck and the front steps and cleared a path to the Jeep and to the mail box. The rest could sit. An aspirin later and I was fine, tired, but not achy. That's how it's been all winter, so far. I take an aspirin before I go to shovel and that seems to prevent the aches I might usually get from ever occurring. My rheumatologist reminds me that aspirin was the choice of doctors for a long time to treat arthritis. Therefore, as long as I go slowly and take the occasional aspirin, I'll be fine. I just shrug at the cold weather warnings. See, this is what winter is up nort'. We have snow. We have cold. Sometimes that cold gets below zero in places. It's bracing and the star gazing at night in the winter just cannot be beat. Man, you can see the underside of God's throne. I'm convinced of it. I think that's part of the Milky Way right there and, if we're really lucky, the Northern Lights put in an appearance. I remember them dancing across the northern sky when I was a girl, undulating waves of green. Dad used to wake me up, if I'd gone to sleep, and come watch them from a northern window. Living in Chicago doesn't allow one to see them owing to light pollution and the fact that they aren't visible this far south. But, there is a very real danger in the cold if you aren't prepared. Wind exposed skin will freeze within minutes at the temperatures we've had during these cold snaps. Blood vessels constrict and reduce blood flow to the extremities first; hands and feet; to protect the core where the vital organs are. Continued exposure causes the water in cells to freeze. Those cells die and take the skin with them, creating black patches where dead skin is. It's not pretty and looks like third degree burns. So, keeping wind exposure to a minimum is paramount. But what if you don't have an attached garage and have to go from the back door to the Jeep? Well, I write a friend and ask if she had some foresight that others didn't. 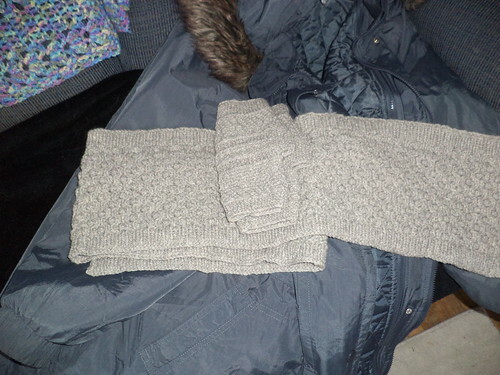 My friend, Terry, knit me a scarf and fingerless gloves for Christmas. They are a light gray and complement my slate gray winter coat. I would not use the gloves in this cold because I want to keep my finger tips warm but the scarf. Let's see. So far, I have worn it a total of 7 days. It's about twice as long as the scarves I crocheted so I can double wrap it around my head and neck. My crocheted scarves were really for the neck, to be wrapped around and employed with a hat. Terry has a knitting club she goes to and I wonder if these were made as part of the club. I love it. I very nearly made a scarf for myself but couldn't decide on the yarn and, by the time I'd finished my last scarf, I was kind of sick of making them and needed a break. It's part of my ritual on these frosty mornings, grab the scarf and wrap it around my head and sides of my face over top my ear muffs, toss the ends over my shoulders and put on the coat. That scarf isn't going anywhere once I put my coat on. No frostbite is getting to me, even if I'm outside shoveling the walk. The only thing I have never, ever figured out in all my years of living where winters are cold, how do I keep from steaming up my glasses. We are expecting our 2nd blizzard tonight into Wednesday. Most of the snow from the first has been washed away by rain. This time, it will stay cold for a while after the storm. I agree that Winter is what it is where we live. That scarf set looks really nice. A very appropriate gift.